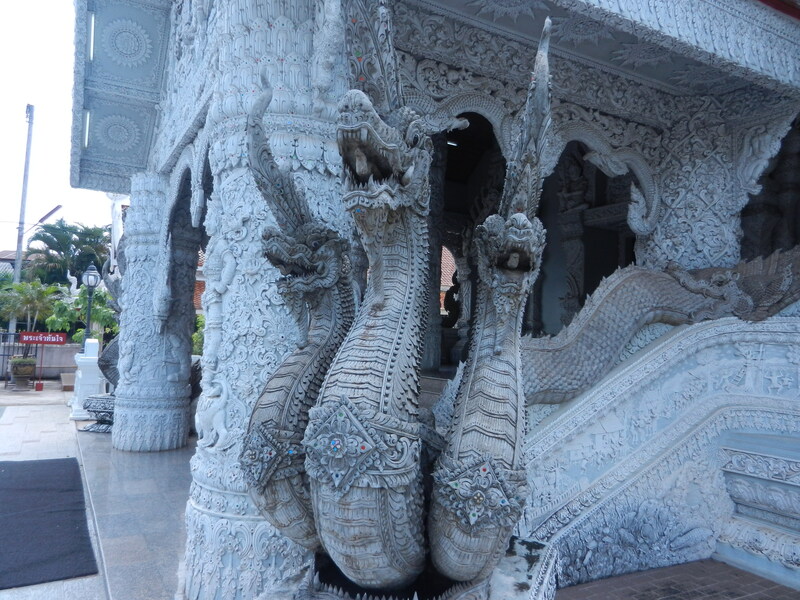 Michael Freeman said that vihara (public assembly hall) in Wat Ming Muang in Nan, Thailand is in stunningly bad taste. OK, I wouldn’t want a model of it in my yard. 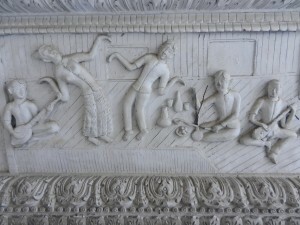 But look closely enough to enter Thai ways of thinking, and your definitions of beauty and ugliness might change for the better. I agree that it’s overdone in places. You wouldn’t find these front columns in Athens. Or even Vegas. 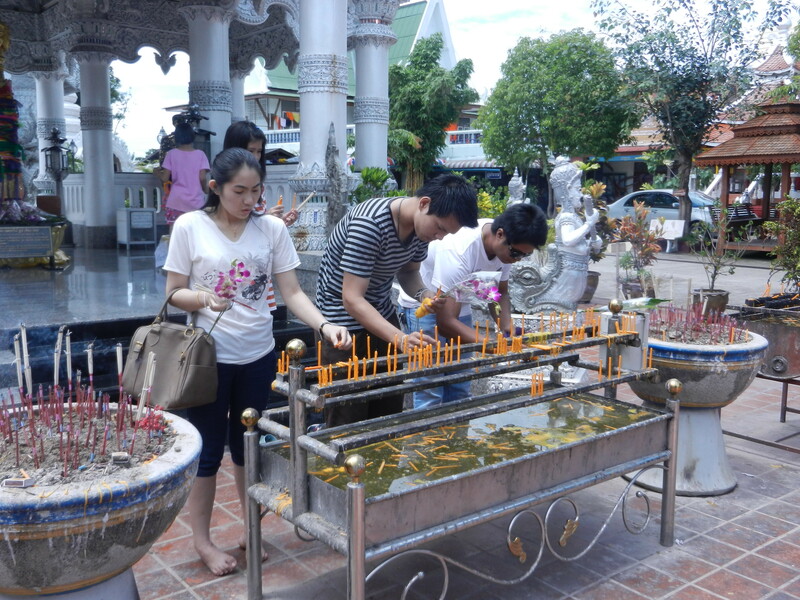 But Wat Ming Muang was one of the busiest temples in Nan. The city pillar presides there–the folks in the above pic are facing it. 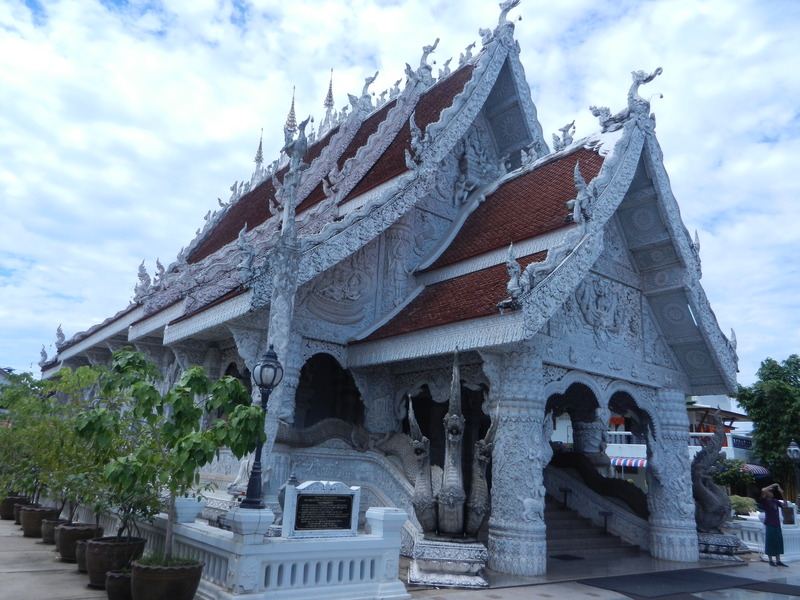 And when I got past the first layer’s kitsch and examined the vihara more closely, I found the building incredibly beautiful. 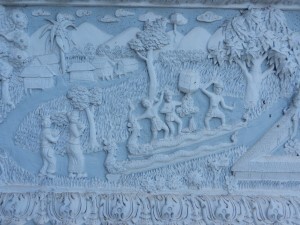 Little plaques with scenes from people’s lives line the building. 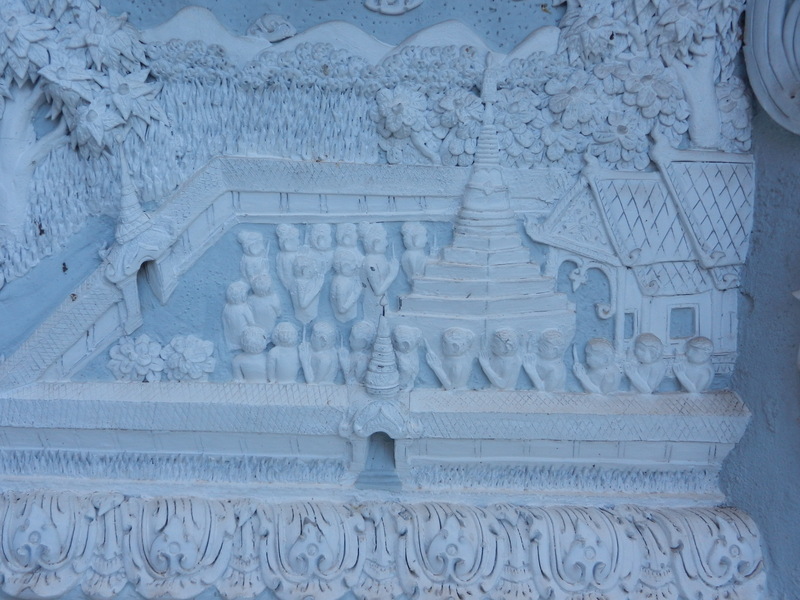 Above, we see folks honoring an elegant Thai stupa. 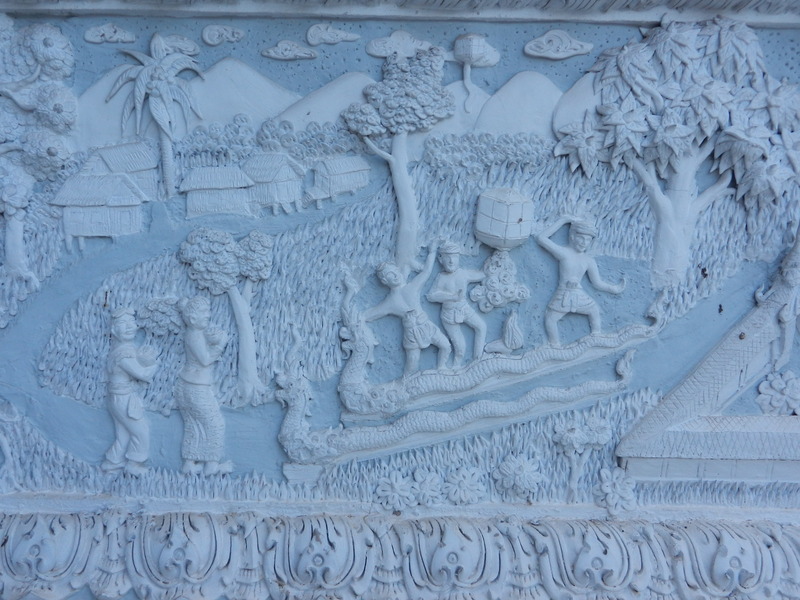 Many fans of northern Thai art admire its human touches. Wat Ming Muang has several scenes of village life. The white and baby-blue colors make the dense and animated foliage more gentle. 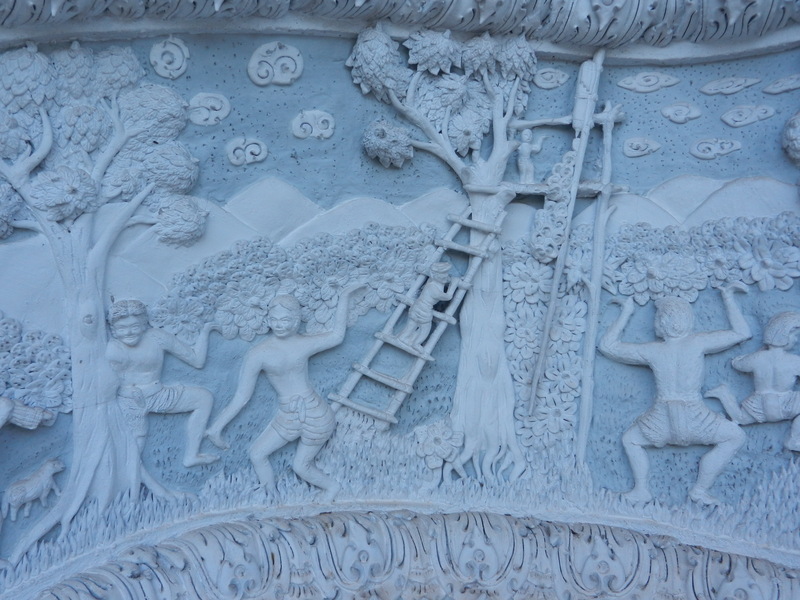 Thai art’s known for humorous touches. 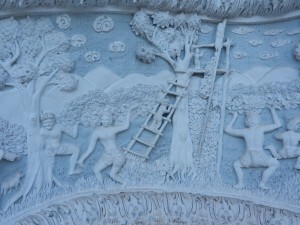 A child climbs a ladder (above) while people dance–perhaps in a ritual to promote crop growth. 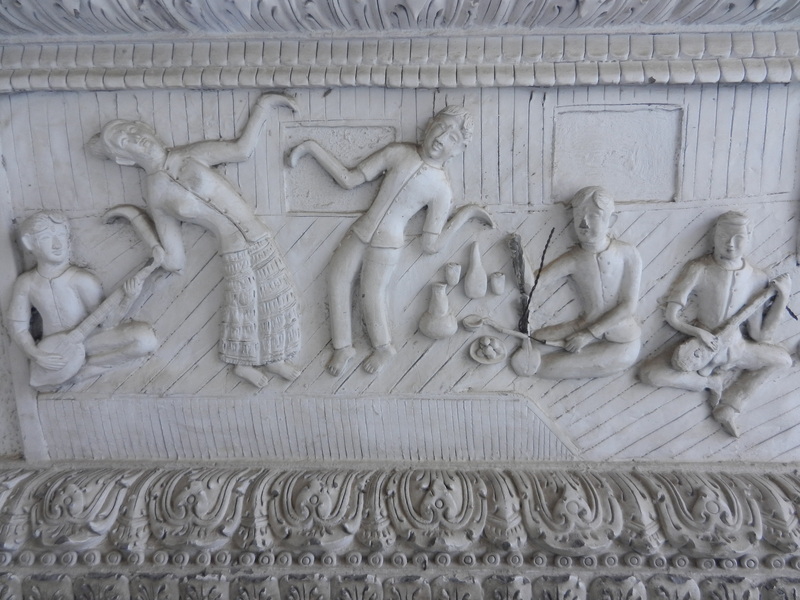 The dancers and musicians above are having a fine old time. 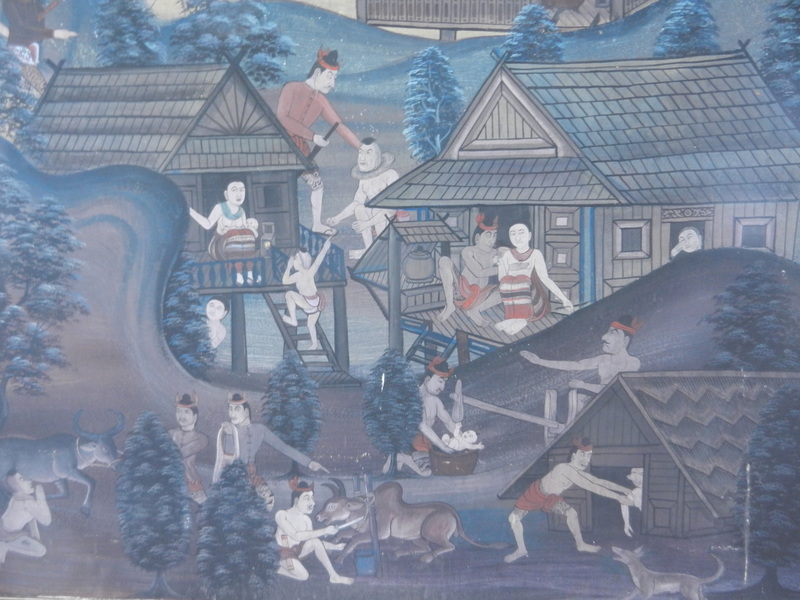 Some of the paintings on the walls inside of the vihara also show idealized scenes of village life. 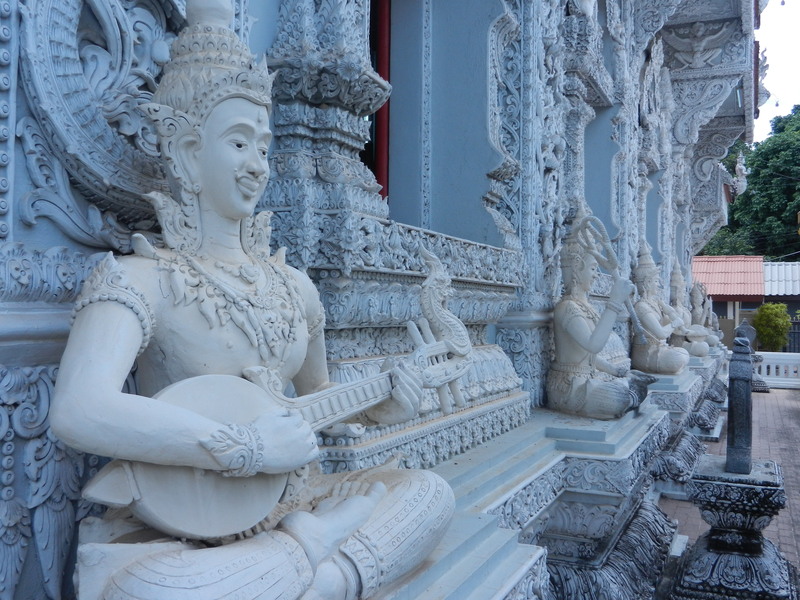 Musicians line the vihara’s outside walls. They’re larger than the plaques that show daily life. 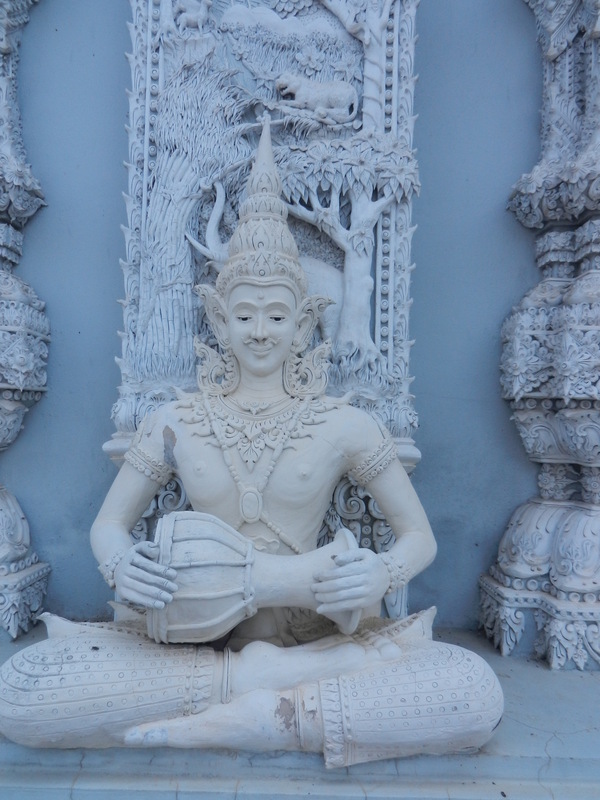 They’re celestial musicians, and they symbolize more spiritual realms. 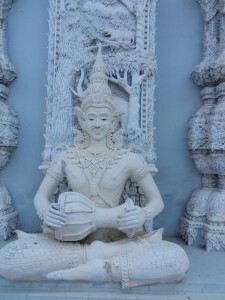 Their graceful forms and peaceful expressions soften the dense motifs behind them. 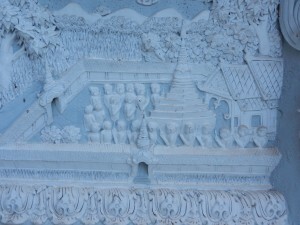 So the whole vihara tolerantly blends the human and spiritual worlds. 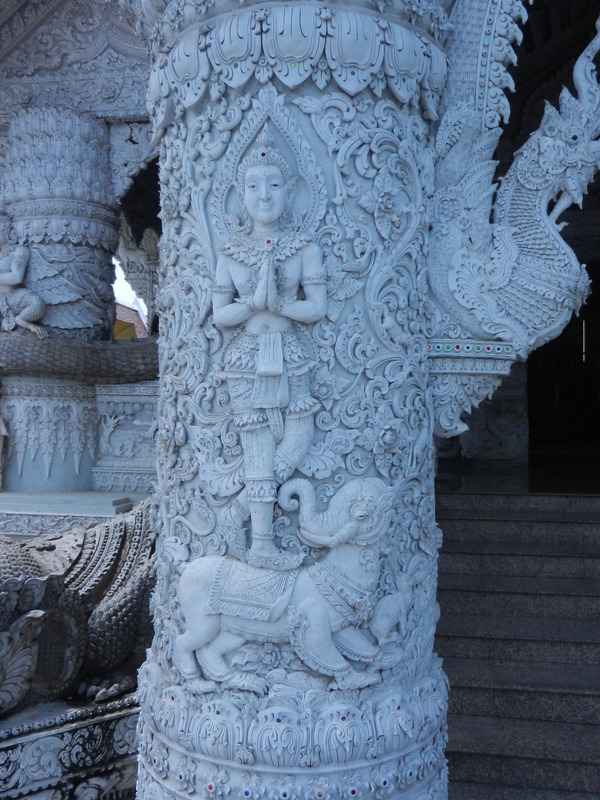 The gracefully formed Buddha statues on the altar glow on all. 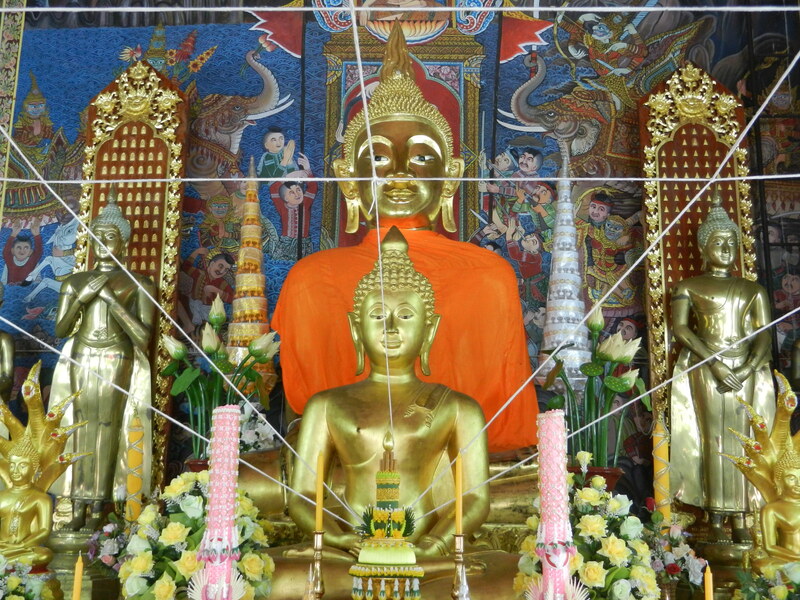 I found Wat Ming Muang as good of an example as any other Thai wat of how the Buddha’s compassion and the endless varieties of Thailand’s graceful art forms reflect each other. It has its ugly spots, but they intertwine with the pretty parts into tropical Asia’s profusion of life forms. 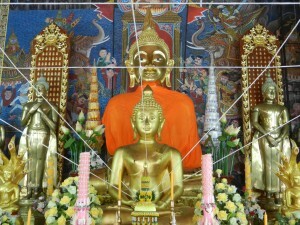 All are allowed a place within the Buddha’s benevolent gaze. The vihara has enough bombast to attract you, but the tolerant way that all forms mix gently nudges you to expand your ideas of beauty to include all life forms. Previous post: Ticky Tacky Thai Style; Is This The Ugliest Temple In Northern Thailand?